Community associations throughout Florida have benefited greatly from last year’s amendments and this year’s expansion of the Condo Act enabling associations to collect rent payments directly from the tenants of delinquent unit owners. Pursuant to the Condo Act, associations are now able to quickly and effectively evict tenants who refuse to comply with their demands for rent. However, some associations needlessly delay utilizing the new teeth that the legislature has provided and exerting legal pressure by filing for eviction against tenants with creative explanations for why they are unwilling to pay the association. In many of the cases that the community association attorneys at our firm are seeing where tenants refuse to comply with an association’s demand for rent, the tenants are residing in units that are in foreclosure. Many of these renters are under short-term or month-to-month leases, and they are often paying reduced rental rates because of the pending foreclosure. In some situations, the associations have no record of the lease on file or they are told that there is no lease between the tenant and the unit owner. When some of these tenants receive the association’s demand, they reply by indicating that they are no longer paying rent to the unit owner, or that the owner has agreed to let them remain in the residence until the foreclosure is over. For many associations, this type of reply from a tenant causes them to question their ability to file an action for eviction – a right that the law allows and which can exert considerable legal pressure on the tenant to force them to begin paying the association. Under the Condo Act, associations have the right to file a complaint for eviction in the name of the landlord if the tenant refuses to comply with the association’s rent demand. The association simply needs to follow the procedures set out in the Condo Act by sending an initial notice letter requiring the tenant to make his or her monthly payments to the association. If the tenant does not make the payment to the association, then the association has the right to commence eviction proceedings as if it were the landlord in a landlord-tenant action by sending a three-day notice of nonpayment. If payment is still not made after the three-day notice, then the association can immediately file a complaint for eviction, which has the benefit of being expedited by court. In eviction proceedings, a five-day summons is issued – meaning that once the tenant is served with the complaint, the tenant has five days to respond. If the tenant raises any defense other than payment, the tenant is required to pay the rent into the court registry. 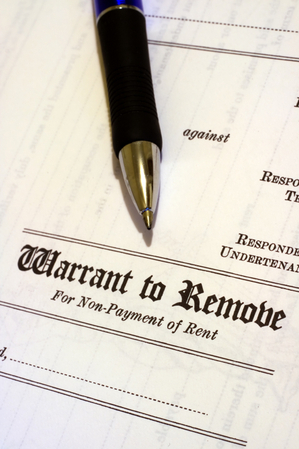 Failure to respond or make the rent payment into the court registry results in an immediate default judgment for removal of the tenant with a writ of possession. Once the eviction process is underway, the association should bear in mind that it is still possible to negotiate with the tenant to try and get them to start making some sort of a monthly payment if they wish to remain the residence. Sometimes the tenant will agree to pay an amount equal to the monthly maintenance fee. If so, at least the association can begin collecting payments for the current and future months of the tenancy. Bear in mind that if the tenant has a written lease on file with the association, the tenant cannot be obligated to make monthly payments to the association in excess of the amount of the rent payment set forth in the lease. As the slow pace of the foreclosure process continues to unwind with many thousands of condominiums and homes in South Florida, cases of tenants refusing to comply with these types of rent demands are bound to continue to grow. For the associations that hope to recover from the housing market meltdown as quickly as possible, using these eviction proceedings against tenants who refuse to comply offers them a powerful new collection tool.